Disaster Management is one of the essential aspects of any virtualization technique. VMWare, being one of the favorite Virtualisation Technique also offers you an option for the Disaster management. Referred to as Site Recovery Manager or SRM – it provides you an automated failover and disaster recovery testing functionality. The service needs you have a subscription to a proper license and VMWare offers you two different plans for the purpose. 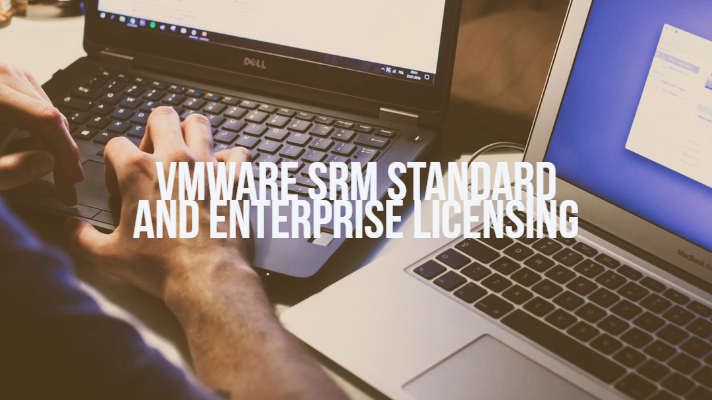 Let us evaluate these two licensing options (VMware SRM Standard and Enterprise Licensing) in clearer detail. VMWare SRM or Site Recovery Manager is necessarily a solution aimed at offering application availability and mobility across multiple sites. This will ensure that a reliable and straightforward recovery option is available and provides the practically no downtime. By definition, the SRM is an automated software option that integrates with the replication technology for a policy based management and an automated orchestration for the recovery options. The service offers non disruptive testing and thus ensures that there is no downtime. The VMWare SRM can speed up the disaster management by improving the recovery time and prioritizes the recovery processes. The automated process involves active synchronization. The data between primary and backup data center is synchronized, and the data from the virtual machine is copied to a secondary site. You can make use of a third-party replication tool or opt for the vSphere Replication tool. The VMWare SRM does not come as part of the vSphere subscription. You will need to opt for the tool as an add-on. You will need to have at least one license for vSphere if you want to make use of the protected and recovery site. If you are an administrator, you will need to make a start with the creation of recovery policies. These policies define the manner in which multiple workloads are recovered. In cases of issues or the nondisruptive testing, the VMWare SRM will automate the process and handles the tasks so that there is no downtime. What are the Benefits of Opting for VMWare SRM? Well, disaster management is one of the essential elements in any system of virtual machines as such. You would not want your processes to be disturbed or facing downtime. The primary advantage of opting for the VMWare Site Recovery management is its ability to reduce the downtime to almost nil. The service can be used for several use cases. Not only for the recovery of your site after being hit by a disaster, but it can also be beneficial for several other use cases. Some prominent examples are Disaster Recovery, migration of your data centers, or avoiding the disasters. The option for nondisruptive testing will allow you to pinpoint the possible issues you may face in recovery. Prior knowledge will help you go for the predictable recovery processes. The VMWare SRM comes with the functionality of failback and failover workflow options. The automated options should ideally make it reliable enough to perform recovery processes and thereby reduce the time required for recovery considerably enough. It can handle the live migration of virtual machines. This ensures that the application mobility is improved and you will be able to achieve the zero time downtime. The SRM will also ensure that the costs for disaster recovery in a significant manner. Of course, the VMWare Site Recovery Manager cannot run on its own. It will need to have a replication technology underlying the process. The technology ensures that the recovery operations are appropriately orchestrated. The vSphere replication tool is one of the best options and comes as part of the vSphere edition. Third-party applications that are compatible with VMWare SRM. These adapters are used for proper integration. The vSphere replication technology is a hypervisor-based replication technology and offers you a customizable recovery point option. The software is well integrated natively with the VMWare SRM and comes with almost all major vSphere plans. SRM Standard – The licensing is best suited for you if you have smaller environments of virtual machines. It offers you up to 75 protected virtual machines per physical site, per SRM instance. SRM Enterprise – This licensing should be ideal for you if you need multiple accesses. It is meant for the broader virtual machine environment. The plan has no limits imposed on the number of virtual machines. Apart from that, there are a few other differences between the two plans for licensing. We will cover them in the following comparison. Well, that is all we have concerning the VMWare Site Recovery Manager and the licensing thereof. As you may have already seen, the significant difference between the two alternative licenses lies in the number of virtual machines supported. If you have more than 75 virtual machines that you would work with, you will necessarily need to go with the Enterprise license. There are a few other subtle differences though. We assume that the information contained in the above examples should ideally be helpful for you in making a well-informed decision. If still in doubt, do share your thoughts with us. We will guide you through the steps involved in addressing the concerns you may have.